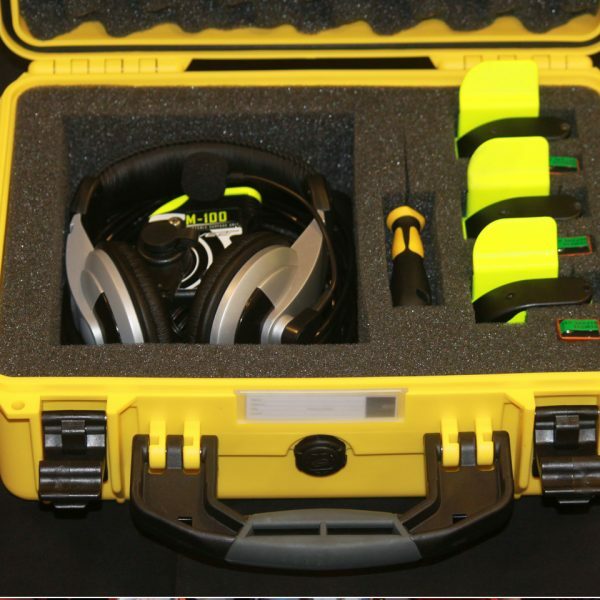 This brightly thought suit case holds all the needed to keep your submerged team of divers well under control. Transportable, lightweight, resistant and customizable. 1M100: The portable surface unit is easy to use – PTT transceiver, just like a VHF radio. The unit turns on when the headphones are inserted into the plug. Once the antenna is placed in the water, communication is possible. Operates on one channel and 9V batteries. 1 M101A: Receiving unit, can be worn on any conventional mask strap, or held between two or more divers for a group communication. These units can receive messages from the boat (M100) within a range of 200m/600 ft. Underwater units don’t require training to be used and turn on when in the water. Automatic activation in the water. 30 hrs approximate operating time. Yellow, for better recognition on the boat. Padded interior for easy fitting and secure handling. Low weight and ready for 2 more M101A units (extras sold separately).